First sentences: "There once was a king who was neither a very good king nor a very bad king, indeed, he was not very much of anything." 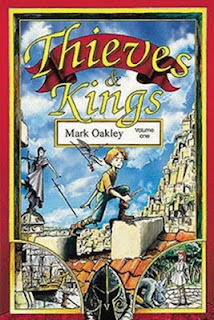 Publisher's Summary: "The first 6 issues of Thieves & Kings. . .
Volume one of Thieves & Kings collects the first six issues of the original comic book series under one cover, introducing the story of the young thief, Rubel. Making his way amidst the powerful events changing his world, soldiers and pirates, kings and magic, and a Shadow Lady of the Sleeping Wood fill his life with gambles and adventure. Does the beautiful princess Katara to whom he has pledged his life really live under a bridge in the darkest corner of the Wood? Find out in the first volume of Thieves & Kings!" Acquired: Borrowed a copy from my niece. Reason for Reading: I'm visiting family in Edmonton and I asked my 14yo niece if she had any graphic novels I hadn't read and she pulled out the first three books in this series which I eagerly accepted after giving them the once over. I have never heard of this series or author before and feel like I've discovered a hidden gem. Canadian cartoonist Mark Oakley has been independently publishing this delightful series since 1996 and I'm surprised it hasn't become one of those cult hits. It is simply splendid! Unique in format this book is what I believe is being called a "hybrid" (a combination of text and sequential art). The book is text heavy, especially at the beginning with long graphic sequences interspersed between these sections. The graphic sections become more frequent as the novel progresses but it is still about a 50/50 presentation. Very much the beginning of a tale the reader can tell we've only just hit the surface of an epic tale, a quest, a journey. Standard fare of two siblings both claiming to be the rightful heir of the throne. However, here we only get the background story and this volume is very much the story of Rubel, the thief, who meets Princess Katara in the woods and becomes bonded to her as the Princess' Thief. It has been some years now and he is on his way to her to be of service; along this journey he is hunted by soldiers, captured and fights with pirates, gains an imp for a companion and is constantly followed and threatened by the Shadow Lady of the Sleeping Wood, the woods where once upon a time Rubel was born. An exciting tale full of derring-do. Rubel is a fun character with a sense of humour and adventure, ready to take on any challenge yet victim to human foibles such as fear, though he is very brave. At the end of the book we are treated to an extra of a short story published in an anthology which stars the princess giving us a delightful taste of her feisty personality while telling what happened to her after the fateful meeting with Rubel. I can't wait to read the next book!